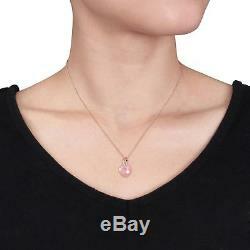 10K Rose Gold Guava Quartz and 2.26 cttw Diamond Accent Heart Pendant Necklace. 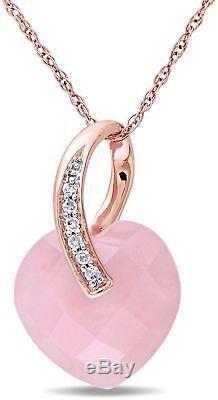 The Rose Gold Guava Quartz Diamond Accent Heart Pendant Necklace is pure romance in pink quartz and dazzling diamonds. Heat treated to enhance color and natural beauty. Rope chain with spring ring closure. Measures 17' L x 0.45' W. Photo may have been enlarged and/or enhanced. A dreamy gift for your sweetheart, the Rose Gold Guava Quartz Diamond Accent Heart Pendant Necklace showcases a delicately faceted pink quartz heart. Sparkling diamonds and a rope chain complete the look. Total stone weight: 5.9 carat TGW quartz, 0.03 CTTW diamonds. Quartz size: 12 mm x 12 mm. Gemstone color: Pink quartz and white diamonds. Gemstone shape: Heart shape quartz, round cut diamonds. Stone count: 7 Total stone weight: 5.9 carat TGW quartz, 0.03 CTTW diamonds Quartz size: 12 mm x 12 mm Gemstone color: Pink quartz and white diamonds Gemstone shape: Heart shape quartz, round cut diamonds. 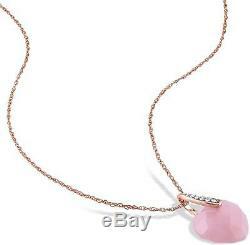 The item "10K Rose Gold Guava Quartz and 2.26 cttw Diamond Accent Heart Pendant Necklace" is in sale since Tuesday, June 26, 2018. This item is in the category "Jewelry & Watches\Fine Jewelry\Fine Necklaces & Pendants\Diamond". The seller is "danasuperdeals2017" and is located in La Center, Washington. This item can be shipped to United States, Canada, United Kingdom, Denmark, Romania, Slovakia, Bulgaria, Czech republic, Finland, Hungary, Latvia, Lithuania, Malta, Estonia, Australia, Greece, Portugal, Cyprus, Slovenia, Japan, Sweden, South Korea, Indonesia, Taiwan, South africa, Thailand, Belgium, France, Hong Kong, Ireland, Netherlands, Poland, Spain, Italy, Germany, Austria, Israel, Mexico, New Zealand, Philippines, Singapore, Norway, Saudi arabia, United arab emirates, Qatar, Kuwait, Bahrain, Croatia, Malaysia, Brazil, Chile, Colombia, Costa rica, Antigua and barbuda, Aruba, Belize, Dominica, Grenada, Saint kitts and nevis, Saint lucia, Montserrat, Turks and caicos islands, Barbados, Bangladesh, Bermuda, Brunei darussalam, Bolivia, Ecuador, Egypt, French guiana, Guernsey, Gibraltar, Guadeloupe, Iceland, Jersey, Jordan, Cambodia, Cayman islands, Liechtenstein, Sri lanka, Luxembourg, Monaco, Macao, Martinique, Maldives, Nicaragua, Oman, Peru, Pakistan, Paraguay, Reunion.